I don’t read much SF (except rare stuff by some JD guy) so I don’t really have dog in this fight. But I really like Eric Raymond’s piece. The phrase “transpose this resentment into the key of politics” is worth rolling around in the mind for a while. It has other applications. It does. ESR is worth reading, and I don’t get to him as often as I should. But then again, time is short these days: I’m trying to re-establish myself in SF. I’m currently finishing up the ebook edition of The Cunning Blood, which will be sold on Kindle (including KU) for $2.99. I’ll also be releasing Firejammer for the first time once I nail a cover. 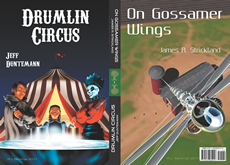 Ditto my longer short works like “Drumlin Boiler,” “Drumlin Wheel,” “Cold Hands,” and “Borovsky’s Hollow Woman.” The big deal will be in January, when I launch both hardsf.com and *Ten Gentle Opportunities. * Much work to be done before then, but I’m making progress and things are looking good. Good news indeed. More stf by Duntemann is most welcome. Many thanks for the vote of confidence. (I’m gonna need it…) And I hope you guys will help spread the word when the material finally hits the streets. Enjoy wandering by here. Usually visit on my laptop. I suppose that you have been following the “Googlegeddon” … where Google will downgrade your site in search results from mobile devices. And your site doesn’t pass their ‘mobile friendly test’, so will be affected. Since this is a WP site, you might want to consider changing themes. My favorite theme is Mantra, which is fully responsive. Easy customization; you should be able to get your design in place with just a few customizations. I use it for many of my web sites.